Regular righty players will be stylin' in true reverse Jimi vibe with this cool lake placid sportin' a tortoise guard & black pickups. Seriously, the guitar looks better this way-- in other words, lefty players might as well seek a righty to look cool. Anyone who's been watchin' the new Eric Gales clips coming out recently knows where I'm coming from. Lefty reverse is sick!!! Our good friend Dave at Guitar Adoptions always keeps an interesting inventory of high end G&L guitars. GA stocks more lefties than most dealers, as well as semi-hollows (thinlines), which G&L is doing a lot of these days. 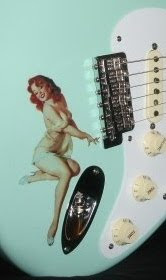 GA has bigger photos of Lake Placid Lefty along with their other fine guitars and cute gals.